HTML is known to be really easy to learn and understand, and understanding the basic rules of <strong>, <em> and other markup tags is not really hard to remember. However, people can get troubled to only see a blank field where they can write their messages. This is indeed the default behavior that you will find in Drupal, as this CMS manages users' comment very well (filtering of invalid tags, invalid markup fixes, automatic conversion of URL and emails to links,...), but provides however a really basic form to post new comments. It could be therefore very interesting to improve your visitor experience by providing a small tool, that will give them some help about the hidden capacities of your website. You have actually several choices to succeed this need, and we're going to discuss about the best one. The markup language, BBCode or HTML? From our point of view, the reasons which explain the creation of the BBCode are no longer valid, at least with Drupal, simply because this CMS is able to filter really well any user generated content that could potentially be harmful for your website. We also think that adding a new intermediate language is not very suited and understandable for visitors, because you have to remember that, at the end, HTML is what is going to be displayed in the user's browser. Note that however, using HTML for writing comments is only well suited if it is combined with a valuable formatted editor. Next choice, WYSIWYM or WYSIWYG? Using this kind of editor is really powerful and give a fast preview of what the user is typing. However, beginners tends sometimes to create horrible messages, with tons of HTML tags, because they wanted to combine multiple series of tags (<table>, to not quote them) and they generally tend break everything by not doing things correctly. Our opinion is then to use more classic editor, that just adds formatting buttons that will directly insert and append markup into the comment form. Among the vast list of existing Drupal plugins, the one we have chosen is BUEditor, for several simple reasons: it is easy to use and install, and is still maintained. BUEditor is really extensible and adds formatting buttons that generate the HTML markup for users. It is then generally really well suited if you allow anonymous and registered users to use filtered HTML in your Drupal website. It's now time to discover how to install it and configure it properly. Go to the BUEditor project page, and download it. Upload it to your Drupal installation and enable it in Site Building, Modules. A new menu, in Site Configuration, BUEditor is now available, it's time to discover it and to enable the BUEditor for all users: user #1 (= admin), authenticated users and anonymous users. In our opinion, it's better to enable it for all, to provide as much services to as much users as possible (including anonymous one). Filtered HTML input format does not allow users to add images, so the default BUEditor image button will not work (at rendering time). 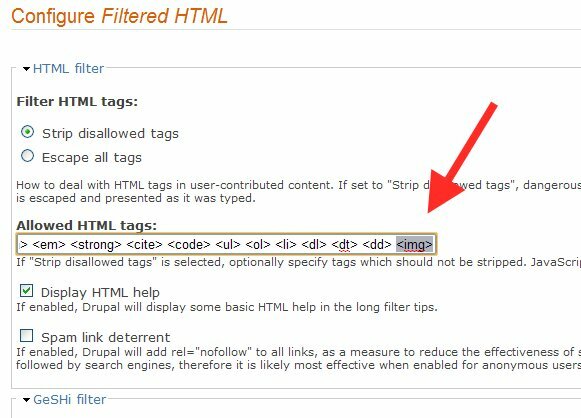 To enable it, go to Site Configuration, Input Formats and click the configure button of the Filtered HTML in the input formats list. Once there, click the additional Configure tab, again (the current tab is normally Edit). Simply add the <img> tab as described in the screenshot below. Open Site Configuration, BUEditor, and click on the Edit button of the Default editor. You can also configure a shortcut key if you wish. Save the current configuration, and reorder the button following your preferences. As you can see in our BUEditor configuration, we have also set up the integration of the Quote module, we added a paragraph button, and the syntax highlighting (that will be discussed in a future article). 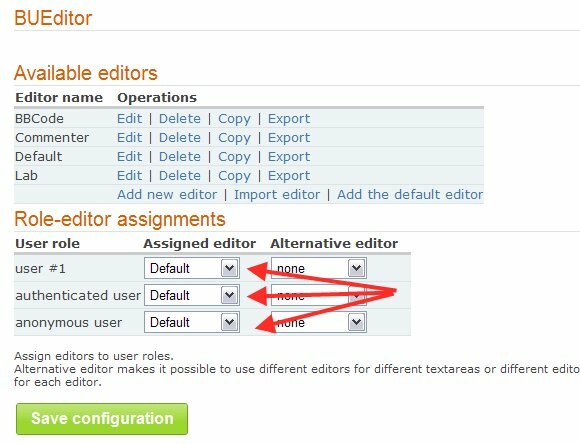 For all of these modifications, do not hesitate to import our BUEditor Default editor configuration file Default.bueditor.txt, and our icons theme bueditor-icons-theme.zip. We hope this tutorial helps you to understand and integrate nicely the great BUEditor module to your Drupal website. Thank a lot for your post! I've been looking for the information on post advance formatting. Finally, I got here in your article while searching for free script software. Thanks for sharing this informative posting. It helps me a lot. AF may be overkill. But you do reach a point of diminishing returns with maintaining your custom code to do the same thing an existing module does. Keep in mind that AF exists because I've already gone down this path of improving core forum, first with adapting the old flatforum module and then adding more and more snippets like these until it got to the point where I extracted all my customizations out of my site and put them in a module for everyone to use. Hi Mark – I don’t have a white paper with details on how SmartAlign works because of IP restrictions. However, suffice it to say that the FW essentially manages the read modify write conditions in the background so the host computer does not have to wait for completion. There’s much more to it that I can’t go into here. Regarding an reformatting and Advanced Format drive to set alignment… There are two companies who are supplying utilities to help with proper alignment for Advanced Format drives. Acronis and Paragon. I think they both provide solutions for setting up partitions properly or re-aligning partitions after the fact. Great questions! This guidance will help a lot to work effectively in Drupal platform.I think the information provides a more essential coding format of HTML to have enhancement in their source code. Thank you very much for this article. I just have installed WP on my site and want to customize it, but it is very hard to me to understand all this php related stuff. So big thanks from a dummie! I've already gone down this path of improving core forum, first with adapting the old flatforum module and then adding more and more snippets like these until it got to the point where I extracted all my customizations out of my site and put them in a module for everyone to use. What is the name of this module? Is it published on http://www.drupal.org ?